If you need a holiday gift for a preteen on your holiday shopping list, this is a great idea! 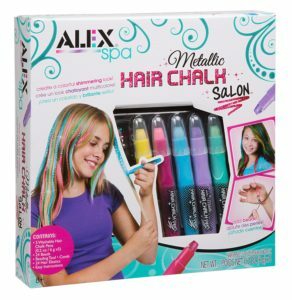 You can get the ALEX Spa Metallic Hair Chalk Salon for only $6.82! That is a savings of 55% because this item is normally $14.99! Make sure that you get this deal soon because the prices can change at anytime on Amazon! CLICK HERE TO ORDER the ALEX Spa Metallic Hair Chalk Salon for only $6.82 today!